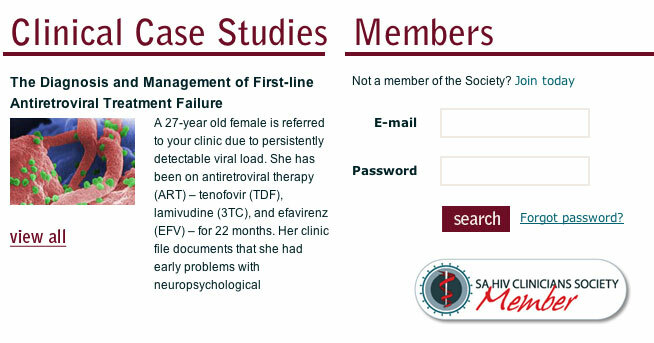 This is the first SATuRN clinical case made available at the Southern African HIV Clinicians Society (SAHIVSoc) Website. The completion of this clinical cases provides four (4) CPD credit points to physician registered at the SAHIVSoc. Case Objective: At the end of this case study, the reader should be able to define the criteria for antiretroviral treatment failure and for switching to second-line antiretroviral therapy. He/she should be able to interpret a genotypic resistance test in the context of the clinical history. He/she should be able to select an appropriate second-line regimen and understand how co-morbidities might affect the choice of regimen. Instructions: This activity is an interactive learning activity and will give you an overview and detailed answers to the questions. Each case is separated into several sections, and only one section is visible at a time. Each section is concluded by a multiple choice question, where you will have to select the most appropriate answer. If this answer is not correct, you will be given the opportunity to re-select another answer. After all the questions have been answered, there will be a post-test questionnaire in order to qualify for CPD points. Only users registered as members of the Southern African HIV Clinicians Society may obtain CPD points. If you are not a member and would like to join, please apply online.